Stocks Unleashed: What to do with plantations now? What to do with plantations now? 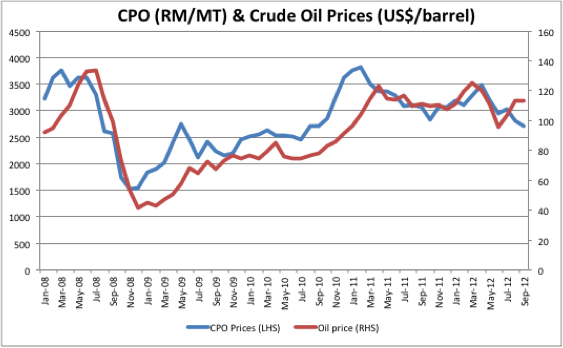 CPO prices had a good run since end of last year with prices rising from RM2,800/MT in Oct 2011 to RM3,500/MT in April 2012. The rise in CPO prices was a result of a confluence of factors, including the rise in crude oil prices, unfavorable CPO production in 1H2012 coupled with tight supply of soybean in the US due to drought. What gave way to slide in CPO prices? 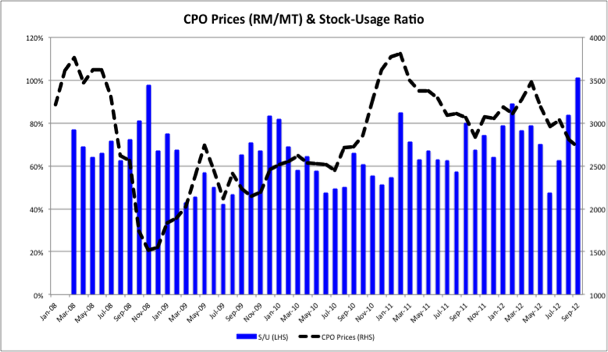 Nonetheless, after rising to the peak of RM3,500/MT in Apr 2012, CPO prices reversed direction to fall by 36% to RM2,250/MT in Sept 2012, brought by concerns of oversupply of palm oil, decreased exports to China, more favorable forecasts of soybean oil supply as US drought could have peaked in Sept 2012 and to a lesser extent a drop in crude oil prices (though it rebounded again to RM113/bbl after hitting a trough of US$95/bbl in June 2012). 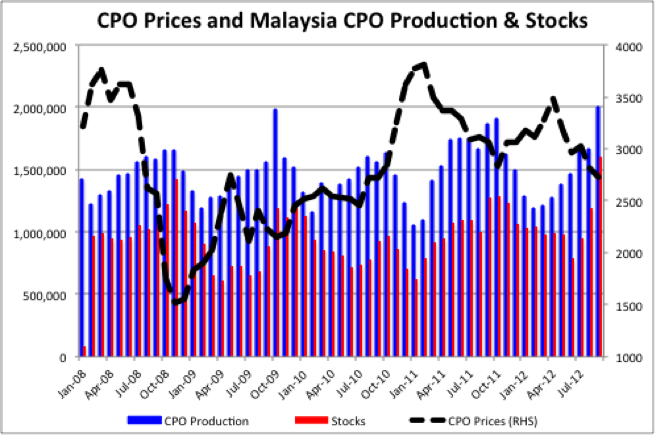 Strong production in Sept 2012: The sharp drop in CPO prices in Sept 2012 was mainly caused by a surge in palm oil stocks, driven by strong production growth and weak exports. 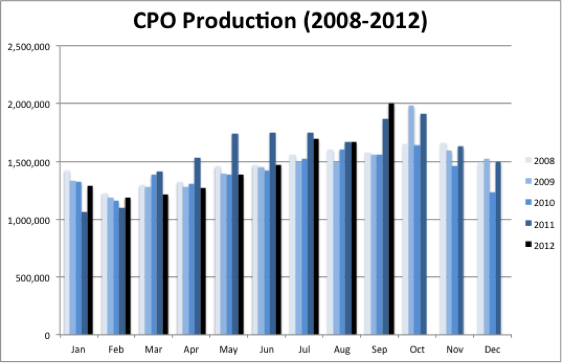 CPO production posted a strong growth of 20.4% mom and 7.2% yoy to 2.004mil MT in Sept 2012 after a lackluster production in the first 8 months of this year. In terms of yoy, Sept month was also the first month to post production growth in 2012. However, YTD production growth was still at -5.1% yoy. Exports remained weak at -2.6% yoy in Sept 2012 and -3.3% YTD albeit a slight increase of 4.5% mom, as China and Pakistan which are the 1st and 4th largest export market of Malaysian palm oil cut down on exports by 19% and 22% YTD respectively. According to Nomura, China had built up huge stockpile of soybean oil in anticipation of tight supply of soybean oil owing to the drought in US over the past few months, which could be the reason for the weaker palm oil exports to China. Surge in palm oil stocks: Owing to huge rise in production offsetting the slight mom increase in exports, CPO stocks rose by 415K MT or 35% mom to 1.61mil MT, the highest in more than 5 years. Expectedly, CPO prices dropped more than other competing vegetable oils such as soybean oil and rapeseed oil. Soybean oil prices had been holding up exceptionally well at above RM3,700/MT, a level seen back in early 2011 when CPO prices were trading at above RM3,500/MT. According to HwangDBS, Malaysia might face a shortage of palm oil storage capacity owing to surging inventories. This could further induce CPO exporters to dump more stocks into the export market and add pressure to CPO prices. Lackluster CPO prices for now, but won’t be for long? Malaysia’s CPO export tax cuts and biodiesel program: Malaysia government will abolish duty-free CPO export quota (2012: 5.0-5.6mil MT or ~25% of total Malaysia CPO production) and cut export taxes to 4.5%-8.5% from current 20-23%. These measures could help upstream players to export CPO with reduced taxes (except for CPO producers with duty-free CPO export quota). However, CPO exports in the past never exceeded CPO export quota, thus CPO exporters will actually have to pay more to export CPO owing to the abolished CPO duty-free quota. This will instead benefit downstream players such as refiners as refiners could purchase CPO at prices slightly higher than spot CPO prices net of export tax. The refiners could take advantage of the weaker CPO prices to gain better margins, which could help reduce palm oil stocks. Having said that, these measures will only be implemented starting 2013, thus the impact will be minimal. On the other hand, the Malaysian government is mulling implementing B10 biodiesel program that could increase CPO consumption by around 300K MT per year to help reduce palm oil stocks. Nonetheless, the timeframe for this program is not known yet, thus its impact to CPO prices might not be visible in the near term. 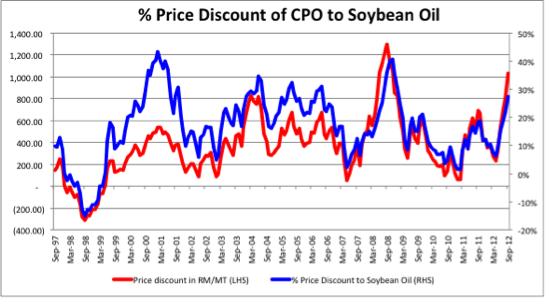 Discount to soybean prices, potentially create a shift in demand for CPO: CPO prices are currently trading at a substantial discount of 30% or RM1,100/MT to soybean oil, the largest discount since early 2009. It is interesting to note that the price discount will tend to tighten back after reaching 30-35% over the past 10 years, save for the dotcom burst in 2001 and the GFC in 2008. Owing to the expected ongoing tight supply of soybean oil coupled with its higher pricing, substitution effect could take place soon. 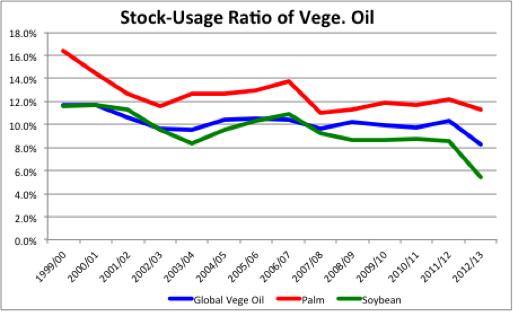 A closer look at the stock-usage ratio (S/U) of vegetable oils shows that it has been tightening over the past decade, with 2012/13 being more severe than the previous years. Soybean oil in particular had a sharper drop in S/U as compared to the average S/U of vegetable oils by decreasing from 8.5% in 2011/12 to only 5.4% in 2012/13. 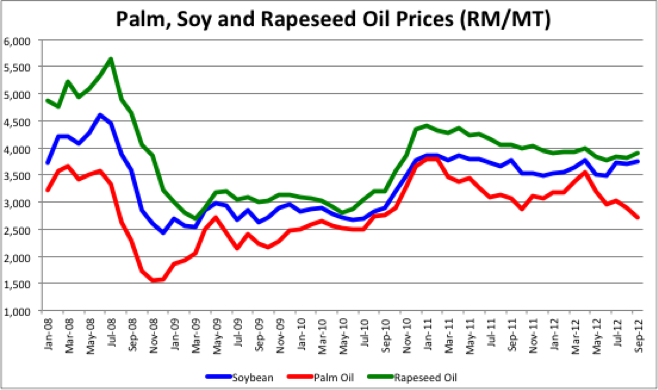 On the other hand, S/U of palm oil still holds steady with only a slight drop in 2012/13. Thus, the shortage of soybean oil might cause a shift in demand for palm oil, the closest substitute to soybean oil, to address the shortfall. Peak production in Oct: Historically, CPO production usually peaks in Oct and thereafter starts declining to hit the trough in Feb. As such, supply glut could ease over the next few months, provided that exports and consumption remain resilient or pick up again. KL Plantation Index not falling as much as CPO prices: Despite CPO prices declining by 35% and 26% since Apr 2012 and Jul 2012 respectively, KL Plantation Index only shed around 7%. One of the reasons could be the market perception that the sharp drop in CPO prices would be temporary and does not reflect a new trend for CPO prices. However, should the palm oil stocks remain persistently high aided by weak exports over the next few months, investors might start to take their chips off plantation counters and trigger another correction for plantation counters. It does not help as well for CPO prices when Dorab Mistry, the director of Godrej International Ltd predicted that palm oil stocks could reach 3mil MT from current 2.5mil MT by Jan 2013. In addition, upcoming quarterly results season is coming with most plantation companies releasing their reports in Nov 2012. There could be further downgrades by analysts owing to disappointment in earnings. Thus, there is likelihood that plantation counters might undergo further correction before staging a rebound towards the end of the year. 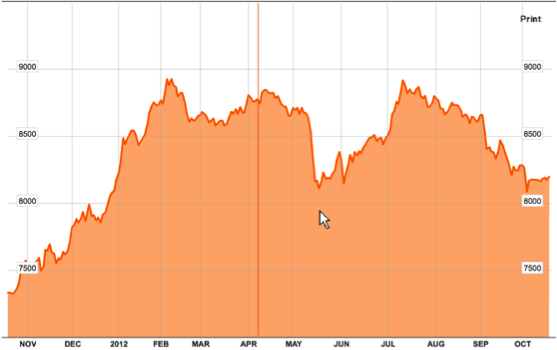 Monitor for now, safer to invest towards end 2012 or early 2013? : For now, it would be safer to remain on the sideline and monitor the palm oil exports (Substitution effect with greater demand for CPO in view of higher pricing and shortage of soybean oil supply? ), MPOB data (Oct will still be a good month for production, thus palm oil stocks could rise even further when monthly MPOB data is out in Nov) and quarterly results of plantation companies (Most will be out in Nov and there could be further downgrades from analysts). 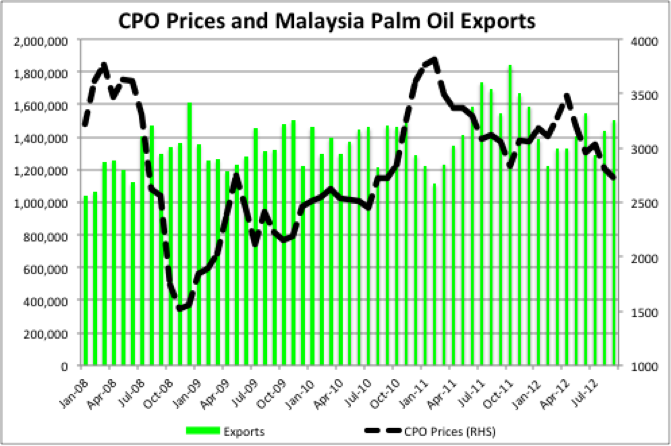 CPO prices could recover during 1H2013 back to RM2,800/MT levels as 1H palm oil production is historically lower than 2H by about 25-30%. Wait and see.